I have a Raypak RP2100 and the LCD display is shot can I purchase just the LCD or do I have to get the whole motherboard? A Answered on 3/5/2019 by InyoPools Product Specialist Lennox H.
Hi, Ronald. You can replace the LCD Display - 013640F if your unit has P.C. Board P/N 013464F manufactured after 05/11. If not you will have to replace the entire P.C. Board P/N 013464F. I just have had one of these fail with some kind of fire that has burned the wiring and cracked the heater manifold. I'm using a salt/chlorine generator system that has always been within expected ppm limits. Is there a problem using a salt system with this heater? Hi, Scott. There is not a problem using this model with a saltwater pool. However, the cupro-nickel model 014938 is the recommended unit for pools with saltwater. I had the exact same thing happen. The unit failed only being a year and a half old. I’m looking to replace it this spring. My old unit was the Raypak 336k BTU. Will this unit work for a 20,000 gal pool? I use propane, will it come ready for use if I order it for propane or will I need to make changes.HOW LONG WILL IT TAKE TO GET TO cROSBY tX AFTER i PLACE THE ORDER AND IS IT FREE SHIPPING. The propane model of this unit is part number 009224 and the average lead time is approximately 3-6 business days. Hi, Brad. This unit weighs 187 pounds. I live in Texas. Have an in ground pool with an attached hot tub. Will this heater be adequate for just spa use? Will it heat a spa to 104 deg? A Answered on 7/25/2018 by InyoPools Product Specialist Parker B.
Hi Joe, this will depend on the capacity of your spa in gallons. what kind of pad should i get to place the heater on ? A Answered on 6/11/2018 by InyoPools Product Specialist Lennox H.
Hi, Georgette. You can construct or purchase a concrete pad to place this unit on. We are looking to replace our 17 year old Raypak 2100 natural gas pool heater, model PR185A. What model would be the closest replacement? Are there any other parts to order for installation? Hi, Dawn. The Raypak 206A will be the closest replacement for P-R185A. Would this work for an above ground 24 ft round ? A Answered on 5/16/2018 by InyoPools Product Specialist Kevin G.
Hello, yes, you can use this on your above ground pool. A Answered on 5/8/2018 by InyoPools Product Specialist Hector F.
These have an average lead time of approximately 2-5 business days for delivery. Yes, those can be moved to the opposite side. We have a 16x32 above ground pool (rectangle). It is 4 feet deep and then drops to 5 feet deep a little over half way. Would this be the correct size heater to purchase? Hi, Bridget. This 206K BTU can be used to heat your pool. If you would like to get more than a 1-degree temperature increase an hour, you can a larger BTU unit. Is their a cover for the round hole in the top of the heater? Hello Chester - It's not shown in the picture but the cover for that hole is included with the PR206AEN. Mark, This is a natural gas heater. I would recommend having your gas company come out to remove the heater. Hi, Mark. This unit will replace you an older RP2100 unit that has a similar BTU and gas source. Does the unit come with the "Pagoda" top or is that sold separately? Hi, Alana. If you're referring to the square cover it does but the Indoor Stack Top - 009838 is sold separately. I have a 30'x12' inground pool. The pool goes from 3-6ft in depth. Currently I use a Natural Gas 181,000 BTU Pool heater. The product is a Raypak RP 2100 Mullivolt Plus. I am trying to order a new heater but do not want to change the size of the gas pipe or water connections. Is this the best solution for that? Is this the most efficient size? Hi, Carlo. Yes, replacing your current RP2100 with a new RP2100 would minimize having to change plumbing and gas pipe connections. This is an electronic unit, not a millivolt so you would have to run power to this unit but is the smallest BTU unit available. The p/n for the millivolt unit is 009192. Yes, this heater can be installed indoors with an indoor draft hood. Please refer to the INSTALLATION & OPERATING INSTRUCTIONS with additional questions or concerns regarding the installation of this unit indoors. Robert, On average, delivery takes approximately 4-8 business days (not including weekends). How much does the 206000 btu NG ELE raypak heater weigh? It weighs about 250 pounds. Does this have a cupronickel heat exchanger? A Answered on 5/6/2016 by InyoPools Product Specialist Hector F.
No the cupro nickel model is part number 014938. Can you give me a link to the installation manual for the Raypak heater 206000 BTU NG ELE? 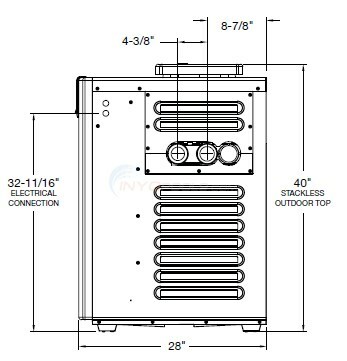 A Answered on 4/22/2016 by InyoPools Product Specialist Alan M.
Hello Bill, Here is a link to the instruction manual for the Raypak 206,000 BTU NG ELE heater. Please note: These instructions are intended only for the use of qualified personnel, specifically trained and experienced in the installation of this type of heating equipment and related system components. Installation and service personnel may be required by some states to be licensed. If your state is such, be sure your contractor bears the appropriate license. Persons not qualified shall not attempt to fix this equipment nor attempt repairs according to these instructions. I have never ordered something like this online. Have you ever delivered one of these units to a customer and for some slim chance this heater did not work or a problem with this unit not working. Just curious what the procedure would be if this happen. I know the chance of this happening is minimal. I'm going to be ordering soon and would like to know what to expect in case there was a problem. Thank you and have a great day. Hi Gregory, We have had some cases in which you've explained. Once the unit is installed then that will fall under the manufacture warranty. The manufacture will work with the installer to resolve the issue if it's cause by a manufacture defect. Would this work for an above ground 30 ft round? Hi Carrie, This unit can be used to heat a 30' above ground pool but it would have to work a bit harder, I would recommend the PR336AEN. have a inground pool Grecian goes to 8ft deep end 37ft x16ft would this 206000btu work??? HI William, This 206,000 BTU unit can heat your pool, however I would recommend the Raypak Heater 266000 BTU NG ELE (009217). It heat your pool faster working less which will make the heater last longer. What are the deminsions of this heater? A Answered on 2/1/2016 by InyoPools Product Specialist Robert M.
The height is 38", the width is 20" and the depth is 28". What are the gas requirements for this heater? 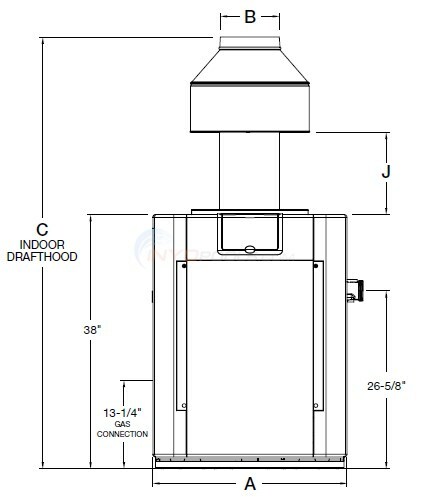 Hi, You can find the gas requirements in the Raypak Owners/Instructions Manual. Is this a low NOx heater? A Answered on 7/16/2015 by InyoPools Product Specialist Joe S.
I am replacing my 17 year old Raypak 2100. will my old venting hood work on a Raypak 206 BTU? A Answered on 6/14/2015 by InyoPools Product Specialist Matt S.
Hello Dave, the venting kit should crossover to the new heater. Raypak vent kits have not changed in quite a while. My house is at 5,600 feet elevation. Spa will be 550 gallons in-ground plaster/concrete. Natural gas-240VAC. No jets. Does heater sense pressure and temperature? What pump should I get to match with this heater? This heater does have a water pressure switch and has a thermostat, so it does sense both water flow and temperature. Since your house is at 5,600 you would need a Raypak High Elevation Heater. The 206,000 BTU Raypak heater has a minimum flow rating of 20 Gallons Per Minute (GPM) and a max flow rating of 120 GPM's. Based on these flow ratings any pump from 1/2 HP to 2 HP would work fine with this heater. Please tell me what differences this model has in comparison to the Raypak 180 K BTU CuPru Nickel heater. Hello LC - This heater has a copper heat exchanger and the 180K BTU has a cupro-nickel heat exchanger. The cupro-nickel is a more durable material. That is the only significant difference between the two models. I am replacing an old Raypak 206k BTU heater and I need to know if this will fit on my concrete pad. Do you have the dimensions of the heater cabinet? I've had my pool for 16 years. My first heater was a Hayward and lasted only 4 years. I was glad to see that my pool company replaced it with a different brand. It was a Raypak. The performance was better than the previous one, and after six years, the heating element was replaced, which was less than 1/2 of the original cost of the unit. The heater lasted another six years, then basically disintegrated. This spring, I began shopping on the internet and found that INYOpools was amongst the lowest pricing that I could find for a replacement, and the shipping costs from Florida saved me quite a bit of money being that I live in the midwest. I installed the heater myself with no problems. the only issue was that my previous heater had a cast iron exchanger with stainless tubes and this new one is poly carbonate, so you can use standard 2" pvc to connect to it. I love the digital controls over the analog ones, (that didn't give you a "marked" temperature control at the source). I have absolutely no regrets that I purchased this heater from INYO. I would certainly do it again 12 years from now. By the way, I ordered the unit on a Saturday and had it at my door the following Wednesday, with no expedited delivery service. Pros: Heats more quickly than older model. Cons: Installation more difficult than expected. When finally installed it works very well and heats a 25,000 gallon pool quickly. I bought this unit to replace the equivalent model from years ago, and found the gas line and water lines were different so the installation was not so easy. Had to find a way to go from 1.5 inch copper to 2.0 inch PVC -- not so easy with a pressure fitting. It works like a charm. My pool is 86°. I have had a permanent smile on my face since I hooked it up. The kids and I were in the pool until 10:45 pm last night - a feat that would not have happened without the heater. It's quiet, automatic, and AWESOME! I live in Minnesota. Now, my pool is opened sooner and we'll see how late in the year we can go...I'm thinking Halloween! I'll never not have a heater.